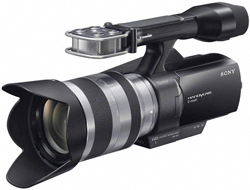 Sony has announced a new exciting interchangeable-lens Full-HD camcorder. The HD camcorder is called Sony Handycam NEX-VG10E and is able to use lenses for the new Nex system from Sony. The HD-camcorder is able to record videos in 1080i video quality at 24mbps, has an external viewfinder and is even able to take still photos with a resolution over 14 megapixels. The Sony Handycam NEX-VG10E camcorder will be released in September 2010 in USA and October 2010 in Europe and will cost about €2000 / $1999.95 with a E18-200mm F3.5-6.3 OSS lens. Building on 25 years of continuous Handycam® innovation, Sony introduces the NEX-VG10E – the world’s first consumer HD camcorder with interchangeable lenses. It’s also the first Handycam® featuring an extra-large Exmor APS HD CMOS sensor that allows the creation of exquisitely cinematic background defocus effects. Targeting video enthusiasts and photographers, the NEX-VG10E opens up unprecedented artistic possibilities not achievable with conventional consumer video cameras. Compatible with a choice of high quality E-mount lenses, it’s the first consumer camcorder that offers the same breadth of creative expression enjoyed by DSLR photographers. Alongside the three currently available E-mount lenses, users of the NEX-VG10E can experience a wide variety of A-mount DSLR optics by using the optional LA-EA1 mount adaptor. Picking from a choice of award-winning Sony G lenses, fixed-focal length Carl Zeiss portrait lenses and other models from macro to super-telephoto, videographers will have unprecedented freedom to explore an exciting world in movie creation. At the heart of the NEX-VG10E is a 14.2 effective megapixel Exmor APS HD CMOS sensor that’s teamed with Sony’s powerful BIONZTM processor to capture very high resolution video and still images. Approximately 19.5 times bigger than the standard sensor found in other consumer camcorders, the APS-C sized imager also enables an extremely shallow depth of field. This allows videographers to achieve ‘cinematic’ results with beautiful background defocus (bokeh). In addition, the ability to capture DSLR-quality still images gives videographers extra shooting flexibility on assignment with less to carry. Full HD 1920×1080 video images are captured in AVCHDTM format at up to the maximum 24 Mbps bit rate for superlative detail and clarity. Unlike many digital still cameras including DSLR that support HD video, there’s virtually no restriction on continuous shooting time. Just slip in your choice of either Memory Stick PRO DuoTM or SD media cards and capture Full HD video and JPEG still images for easy transfer into your existing PC storage and editing environment. The NEX-VG10E comes supplied as standard with an image-stabilised E18-200mm F3.5-6.3 OSS lens that offers a powerful 11x optical zoom range. Because of its optimized design for video shooting, this high-quality E-mount lens offers smooth, ultra low noise autofocus and iris control. In-built Optical SteadyShot image stabilisation assures clearer video images when you’re shooting handheld. At wide angle settings, Active Mode enhances anti-shake performance even further, steadying jittery images even while walking. The lens also features a circular aperture for the creation of beautiful bokeh effects whether you’re shooting video or stills. Reflecting the demands of serious videographers, sound quality matches the phenomenal imaging performance of the NEX-VG10E. The Quad Capsule Spatial Array Stereo Microphone uses advanced processing algorithms to combine signals from four separate omnidirectional microphone capsules. The result is exceptionally clear stereo audio with a highly directional response: this allows videographers to capture more sound from the subject they’re shooting, and less of distracting sounds around them. There’s also a jack for adding an optional external stereo mic, plus a headphone jack for audio monitoring. With a photo-realistic 921k dot resolution, the 7.5cm/3 inch-type Xtra Fine LCD features TruBlackTM technology for an exceptionally detailed, high contrast view of images and menu settings. The LCD is supplemented by a high-resolution (1152k dot) electronic viewfinder that assists easy framing and monitoring. The viewfinder helps operator capture clear images in bright daylight and its angle can be easily adjusted for comfortable operation. Despite its groundbreaking creative possibilities, the NEX-VG10E is compact, beautifully balanced and easy to handle, even for novice videographers. An intuitive jog dial and hotkeys make it easy to navigate camera menus and adjust shooting parameters. Videographers can also enjoy precise manual control over Iris, Shutter Speed, Gain and White Balance for professional results. A range of official accessories includes the ECM-CG50 Shotgun Microphone that attaches to the camcorder’s accessory shoe. There’s also a choice of rechargeable battery options, including the NP-FV100 that provides power for up to 330 minutes continuous HD shooting. A dedicated soft carrying case LCS-VCD is also available as an option. Offered to customers as a free download, Vegas Movie Studio HD Platinum 10 video editing software includes everything you need to produce spectacular HD movies. Powerful tools for video compositing, colour correction and sound mixing make it easy to achieve cinema-quality results in your own home studio. You can also upload movies to web, burn them to Blu-ray Disc™ or author DVDs with custom menus and graphics. The Handycam® NEX-VG10E interchangeable lenses Full HD camcorder is available from October 2010.